The last three minutes of my MarTech Conference presentation are driving me crazy. The preceding portions cover the current state of Customer Data Platforms. I have no trouble talking about that. But it somehow got into my head that the last section should look at how CDPs will fit into the long-term future of marketing technology. I have some fuzzy notions that this future martech will be radically different from today. But to cover it succinctly I must first think it through in detail. That has been considerably harder than I expected. Here’s what I have so far. These are developments happening now that will provide the context for industry changes. Some will be the topic of other MarTech presentations. • Convergence of Adtech with Martech. These have until recently been largely separate: Adtech deals with messages to audiences whose members may share common characteristics but are not individually identified. Martech deals with known individuals. As anonymity becomes increasingly unavailable, marketers will know exactly who is receiving their advertising messages. Martech targeting techniques will therefore be used in adtech as well. 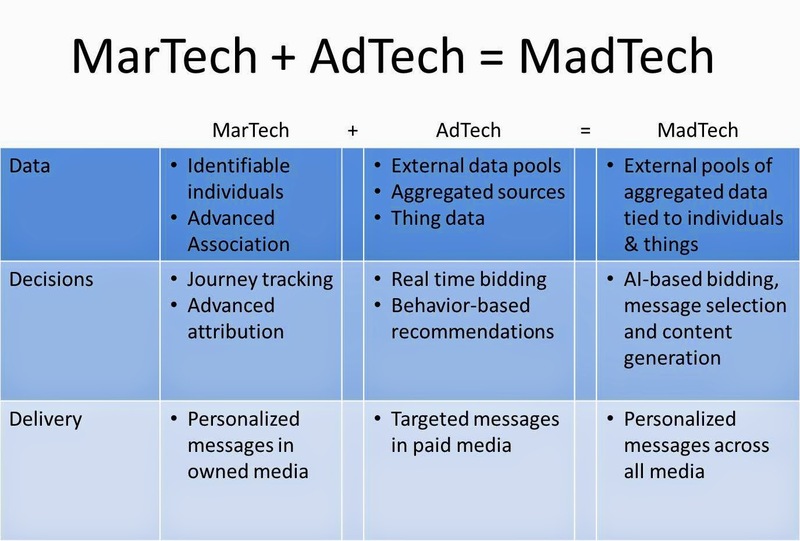 Conversely, some adtech features will become standard martech practice. More about that later. • Contextual data. Social networks, mobile devices including phones and wearables, and the Internet of Things will provide ever-more details about the precise situation of each customer during each interaction. Location is an obvious data point, but marketers will also know your local weather, your mood and physical condition, what you’re wearing, when and what you last ate, and whether your car needs gas. This may sound seriously creepy but the good news is you’ll get better-targeted messages. I’d love to call this “contextual marketing” but that term is taken. • Marketing to machines. I’m not talking about marketing with machine-generated data (e.g., your running shoes telling Nike how many miles you’ve logged) or marketing through messages on your machine (your washer suggesting you buy Tide-brand detergent). I’m talking marketing to machines that are making purchase decisions on their own. I discussed this last year in Do Self-Driving Cars Pick Their Own Gas Stations? and More on Marketing To Things. Frankly, I've been surprised to see little else written on the topic. Trust me, this will be big: imagine convincing Siri to recommend your restaurant every time someone asks where they should go to lunch. Given the trends I’ve just listed, I see martech changing significantly. • Data synergy. I just made that term up but the idea is old: related bits of data are worth more when they’re combined. So knowing you just booked a trip to Alaska and knowing you just walked into a department store are each marginally useful by themselves, but together they let you offer me a great deal on a warm coat. It helps even more if I know you don’t already have one. The implication of this is that there’s a lot of value gained from combining data from different sources into shared repositories. It also implies there’s a lot of value in “identity association” technologies that link related data to the same person. If you've been wondering why companies like Oracle, Acxiom, and Nielsen have been buying big data aggregators, you can stop. • Everything is biddable. Another implication of data synergy is that each opportunity to communicate with an individual will be much more valuable to some people than others. Let’s stick with that Alaska trip: selling you a coat might be worth less than selling you a hotel room. So, when you walk into the store, the hotel chain might be willing to pay more for the chance to send you a message than the store itself. Having all the messaging devices connected to a central database and bidding system makes this possible – in fact, it already happens with real time bidding on Web ads. Now Martech platforms get to do the same. And oh, to make this work well, Martech has to hugely improve its ability to measure the actual impact of each message – so advanced, predictive attribution also plays a leading role in the martech world of the tomorrow. • Campaigns are dead but the customer journey lives on. If each interaction is bid separately, then the notion of campaigns that lead the customer through a sequence of contacts on a flow chart is irrelevant. Honestly, I’m glad to see it go: the very first campaign management system I saw, more than twenty years ago, had exactly that sort of interface and it’s well past time for a change. But this doesn’t mean we can stop thinking about customer journeys. Any model that supports bidding on individual messages must understand where each customer is in her journey and how the message will influence the result. Of course, different marketers will be tracking different journeys. • Automation takes over. It’s obvious that mass data consolidation, real time bidding, optimized messaging, and omnichannel execution require near-total automation of the entire process. This has to be really intelligent automation that finds patterns, notices when they change, and optimizes treatments with minimal human guidance. And where will all that highly tailored content come from? You guessed it: automated content creation systems, which are more common and further advanced than you may realize. 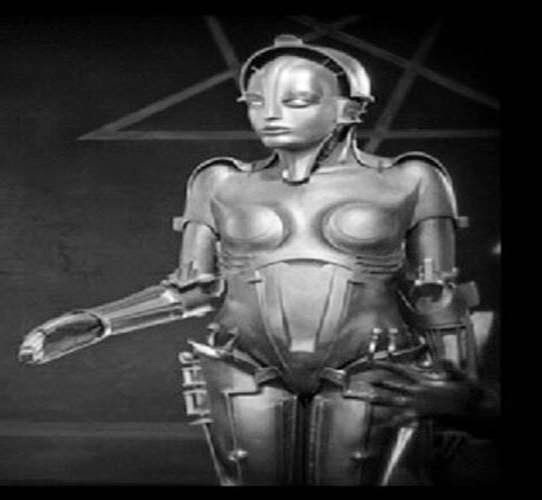 See Paul Roetzer’s recent post on artificial intelligence in marketing automation for an introduction to the topic and watch Humans Need Not Apply if you want to get really scared. • Machines buy martech. If the over-all trend is machines selling to other machines, why should martech be left out? In fact, testing the huge number of new martech options (or even generating Scott Brinker's martech landscape supergraphic) is something machines could do really well. Once suitably open architectures are in place, it should be easy to plug in new components like a better predictive modeling system, new type of video promotion, or the latest social media app. Even if those components are less than fully automated, they could be identified, screened, integrated, and assessed with minimal human intervention. Machines would almost surely assess results better than humans, since they’d be more objective and better able to look for subtle effects on customer behavior than human analysts. • Humans keep things running. It’s possible that machines will eventually control every aspect of our marketing. But I think humans will have a role to play at least for a while. This won’t necessarily be the traditional “creative” work such as copywriting and design, which machines already do better than we care to admit. But they’ll still need people to come up with non-incremental products, non-obvious insights, and deals with other organizations. Even things that machines could do better than people won’t be wholly machine-run for a while, just due to the normal lags in technology and organizational development. This may sound like a dark view of humanity’s future, but I’m more optimistic than it seems. Technology never works quite as well as promised, so I figure humans will still be needed to keep things running. If Martech moves in the directions I’m proposing, marketers need to do certain things to prepare. • Expect imperfection. Sure we’ll have vastly more data than ever, but don’t assume it will be perfectly complete, accurate, or integrated. In fact, you can guarantee it won't. Predictive models make mistakes as well. Look for systems that are designed to accommodate incomplete information, check for differences between actual and expected performance, and adapt gracefully to failures. Above all, demand transparency so you can see what the automated systems are doing and have some idea of why. This will probably require help from other systems, but make sure the monitors are as independent as possible so they’re not fooled by shared mistakes. If you’re really feeling clever, examine imperfections for opportunities – you may find bargains in bidding on messages to customers that other systems have rejected because their data is unavailable or contradictory. • Plan for change. As anyone who has tried to modify a complex campaign workflow already knows, sophisticated systems can be brittle. High performance automated systems are likely to optimize themselves for specific conditions, which is great until those conditions change. Be sure you can easily introduce new data sources, components, objectives, and execution channels. And be sure you can always revert to a simpler, more manual mode of operation if things really go bad. • Focus on the analytics layer. One implication of data synergy is that the richest databases will live outside of your company’s own data center: they’ll be too big, too complicated, and updated too frequently to maintain a copy in-house. Similarly, if companies are bidding to deliver messages everywhere a customer appears, they won’t own the touchpoints. So the only piece the company can expect to own is the analytical layer – the bidding and content engines. Those engines should be freely swappable as well. What’s left to hold things together is a core of profile data shared by the analytical and content engines. This is connected to the external data store on one end and the touchpoint systems on the other. All told, it’s a rather wispy little framework, but it should be enough to provide the glue needed to link all the other components. So, where does that leave us? Gigantic external data pools linked to personal identities, real time bidding, messages delivered through paid channels: it's "adtech without the privacy" if you want to put it in a nutshell. That isn't where I expected to end up, but that's exactly why I needed to write this. I can’t guarantee I won’t change my mind after further reflection, but for now I think this gives a reasonable picture of what martech might look like five or ten years from now. In the shorter term, I still expect the central role will be played by Customer Data Platforms or (more likely) by Marketing Platforms that combine the data parts of a CDP with a multi-purpose analytical and decision layer. Now all I have to do is figure out how to cram this into three minutes. 1 - Hadoop does make 'owning' your own data cost-effectively viable. But NOT in the way it's being implemented today where it's dependent on highly-skilled and high-priced MapReduce coders. Drag and Drop UIs, like RedPoint's, are able to speed up access to data and build the 'synergy' you talk about elsewhere. Hmmm. Not sure I agree with "focus on the analytics layer." Unfortunately, it's all pretty integrated in my mind: the data, the analytics, the execution... it all has to work synergistically. Especially in today's real-time, multi-channel world. If you ignore the quality -- or breadth -- of the data, then you're analyzing the wrong thing and potentially ending up with the wrong conclusions. OR, if you're only doing 'rear-view' analytics you may gain insights into 'what happened,' but not about 'what's happening' NOW or what's about to happen (in-line, predictive analytics)...And if you're not considering letting the machines make the decision on offers for you (based on prescriptive advanced analytics) than you're creating latency. The big question is how do you keep your data, analysis, and interactions with the customer in dynamic sync? No small feat for the modern marketer.